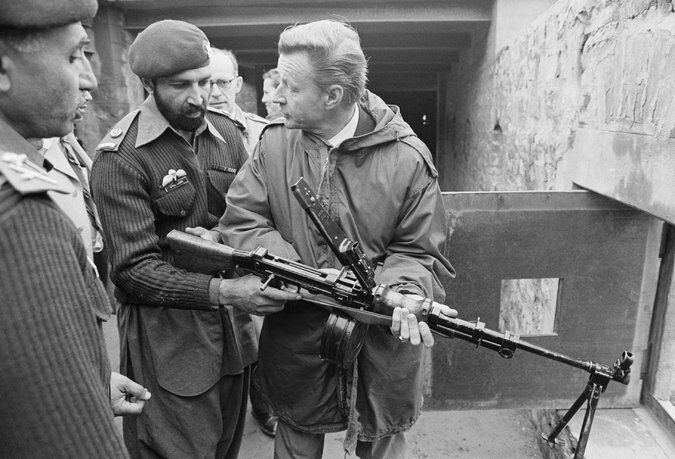 Visiting a Pakistani Army outpost in 1980, Mr. Brzezinski used the sights of a machine gun to look across the Afghan border. He supported billions in military aid for Islamic militants fighting invading Soviet troops in Afghanistan – this description is according to the NYT obituary on Zbig, but in actuality, he admitted in a 1998 interview with a French newspaper that he played a role in goading the Soviet Union into invading Afghanistan in order to give the USSR its own “Vietnam” quagmire. On May 26th, Washington’s most famous Russophobe, Zbigniew Brzezinski, exited the stage at the age of 89, having wreaked much havoc on the world. For further details on Zbig and why no one should be shedding any tears at the demise of this architect of hatred and mayhem, see my previous posts on his background and Grand Chessboard philosophy here and his most recent nonsense here reflecting a man who once was touted as a geopolitical genius in the nation’s capital but had been recently reduced to pathetic attempts to try to stay relevant, still claiming that Russia and China could be seduced away from their strategic partnership by the whispering of a few sweet nothings from the fetid breath of Washington’s political class. Veteran investigative journalist, John Helmer, who had an advisory role in the Carter administration and had a front row seat to Zbig’s machinations, did a write-up of him here. Perhaps Zbig can dust off a few seats next to him in the underworld for Kissinger, Cheney, Albright and other warmongers. Well, it’s been over 3 weeks since I made my trek to Russia for a working vacation and to report on what I saw, and now that I’ve returned to look at the American news cycle, it’s still all about how Russia hacked our democracy and is guilty of all sorts of shenanigans to take down America. In any event, Brennan’s admission of no actual evidence follows Dianne Feinstein’s admission to Wolf Blitzer on CNN a few weeks back that, after a classified intelligence briefing on the matter, she was provided no evidence of collusion. And that follows former DNI James Clapper admitting in an earlier interview in March that, as of January 20th of this year, there was no evidence of any actual wrongdoing in terms of collusion between the Trump camp and Russia to interfere in the election. After 10 months of investigating, we still have no evidence for any of these claims being made and kept alive in the interests of the Clinton wing of the Democratic Party. According to a recently released book on why Hillary Clinton’s campaign failed, called Shattered: Inside Hillary Clinton’s Doomed Campaign, members of her campaign began cooking up the blame-Russia excuse for her loss in the immediate aftermath of the concession. Clapper back in March told Meet the Press that when he issued a January 6th multiagency intelligence community assessment about Russian interference in the election, the report didn’t include evidence of collusion between the Trump campaign and Russia, essentially saying he hadn’t been aware of any such evidence up through January 20th, his last day in office. On Sunday, he said that didn’t necessarily mean there was no such evidence, because sometimes he left it up to agency chiefs like former FBI Director James Comey to inform him about certain things. Clapper said something similar when he testified before the Senate Judiciary Committee last Monday. In prepared remarks, he essentially said that there was nothing odd about his not being informed about the existence of an FBI counterintelligence investigation involving Donald Trump’s campaign. He went on, explaining that in such a situation, it wouldn’t be unusual for the DNI to not be informed about an FBI counterintelligence investigation. In his Senate testimony, Clapper went out of his way to say this didn’t contradict his earlier statements. But if he’s not contradicting himself, he’s certainly added a layer of confusion to what is already the most confusing political scandal ever. Taibbi goes on to describe how Clapper’s interviewer on Meet the Press asked the question again, more than once, in order to ensure that Clapper understood the gravity of the question and would give a consistent answer. He did the same with questions about knowledge of any evidence in support of the charge of collusion between the Trump campaign and Russia. Again, Clapper said he was aware of no such evidence at the time he left office. Taibbi also points out logical inconsistencies in what Clapper has subsequently told both the Senate and the media and what recently fired FBI director James Comey has said. Comey was saying that he hadn’t briefed the DNI because between January 20th, when Clapper left office, and March 16th, when former Indiana senator and now Trump appointee Dan Coats took office, the DNI position was unfilled. If Comey felt the existence of his investigation was so important that he he had to disclose it to DNI Coats on Coats’ first day in office, why didn’t he feel the same need to disclose the existence of an investigation to Clapper at any time between July and January? Taibbi provides some theories from Washington insiders about what may explain these inconsistencies, but ultimately, no satisfactory answers are given in light of the gravity of the vague accusations and the constant barrage of innuendo. But it’s our job in the media to be bothered by little details, and the strange timeline of the Trump-Russia investigation qualifies as a conspicuous loose end. What exactly is the FBI investigating? Why was it kept secret from other intelligence chiefs, if that’s what happened? That matters, if we’re trying to gauge what happened last week. ….But when it comes to the collusion investigation, there are serious questions. A lot of our civil liberties protections and rules of press ethics are designed to prevent exactly this situation, in which a person lingers for extended periods of time under public suspicion without being aware of the exact nature, or origin, of the accusations. Not only is it driving the country crazy, it is conveniently taking coverage away from pressing domestic issues that need to be addressed, such as increasing poverty, health care, and failing infrastructure (among others) and it is also preventing any chance of decreasing tensions with the world’s other nuclear superpower. Now, the talk is about Jared Kushner and others allegedly wanting to set up a back channel of communication with Russia. According to Alexander Mercouris’ analysis, the back channel was an idea apparently intended to facilitate the discussion of actions in Syria and was never followed up on. The idea apparently was that Flynn would use this back channel to discuss with the Russians the conflict in Syria and other security issues. ….There is no suggestion here that the back channel was intended to discuss possible collusion between the Trump team and the Russians relating to the US political process. Of course by this point the election was over, so this proposal for a back channel can have no bearing on the allegations of secret collusion during the election between the Trump campaign and the Russians, which are the subject of the Russiagate investigation. And the implication is, of course, that the establishment of such a back channel, had it occurred, is necessarily a bad and nefarious thing. A little history lesson is in order here. John Kennedy set up a back channel of communication with Soviet Premier Nikita Khrushchev and that back channel came in very handy when dealing with the Cuban Missile crisis. Some even plausibly claim that that back channel enabled the de-escalation of the crisis and prevented a nuclear war. Establishing as much direct communication as possible between the world’s two nuclear superpowers, especially during times of high tension, is a GOOD thing. Any rational person whose brain is not irredeemably compromised by pathological partisanship should be able to recognize this. Meanwhile, Russia is putting its head down and continuing on with its plans to participate in the One Belt, One Road (OBOR) plan for peaceful trade and infrastructure investment spearheaded by China. Two of the most knowledgeable writers on the OBOR initiative, F. William Engdahl and Pepe Escobar, have each recently published articles providing additional insights and updates on the plan’s progress, which could make the 21st century the Eurasian Century – supplanting the world hegemony that Washington has enjoyed since 1945. ….The American Century is crumbling before our eyes, and has been doing so for the near-five decades since August, 1971. That willful ignoring of the health of the economy of the United States over decades has created a vast moral, political and economic vacuum in the world today. Escobar’s article covered the recently-convened “Belt and Road Forum” which took place in Beijing where the Chinese president followed his usual custom of the past several years when he invites Putin to an important forum – he placed him right at his side. It’s the kind of move that seasoned international observers know is not done willy-nilly. History will record the Belt and Road Forum in Beijing marked the juncture where the 21st century New Silk Roads assumed their full character of Globalization 2.0, or “inclusive globalization,” as defined by President Xi Jinping in Davos earlier this year.I have dealt with the monumental stakes here and here. Terminology, of course, remains a minor problem. What was once defined as One Belt, One Road (OBOR) is now promoted as the Belt and Road Initiative (BRI). Much is still somewhat lost in translation in English, what matters is that Xi has managed to imprint the myriad possibilities inbuilt in the concept especially across the Global South. ….President Putin and Foreign Minister Sergey Lavrov were guests of honor at the forum – alongside leaders such as Kazakhstan’s Nazarbayev and Turkey’s Erdogan. At a business breakfast discussion, Xi seated Putin to his right and Lavrov to his left. – There is now a “unique opportunity to create a common cooperation framework from the Atlantic to the Pacific – for the first time in history.” Essentially, this is what Putin himself had once proposed – then shunned by EU/NATO – even before Xi announced OBOR in 2013. Washington doesn’t seem to have a constructive or even workable policy to deal with this. Instead, it is humiliating itself with its Nora Desmond act on the world stage. Geography has been a double-edged sword for Russia. On the one hand, geography has blessed it with much beauty and prodigious natural resources. But geography has also made Russia vulnerable due to a lack of oceans and mountain ranges to fend off invaders. This combination has made Russia an irresistible temptation to megalomaniac leaders, like Napoleon and Hitler, who thought they could conquer this vast land that straddles two continents. And what did Napoleon and Hitler get for their hubris? Russians galloping into Paris and rolling tanks into Berlin, to paraphrase Dmitry Orlov. Although many Americans and Europeans have now bought into the America-centric rhetoric of the U.S. winning WWII in Europe, it was not controversial in the aftermath of WWII to acknowledge that the Soviet Union had, in fact, broken the Nazi Wehrmacht, likely saving many American lives by bearing the brunt of the fighting as one of FDR’s advisers had talked him into going into North Africa in late 1942, which significantly delayed the U.S. opening up a western front attack on Germany. It’s a shame that the Cold War and Washington’s post-Cold War triumphalism have undermined our ability to acknowledge the sacrifices and achievements of the Soviet Union when we were allied against the Nazis. But with or without the west’s approval, Russia solemnly commemorates Victory Day each year with elaborate parades in major cities, like Moscow and St. Petersburg. The Russian president gives a speech before the Moscow parade and the parade is followed by the Immortal Regiment Rally in which Russians march through the streets carrying photos of family members who fought and/or died in the Great Patriotic War (WWII). The nights leading up to Victory Day this year included light shows on a trio of large high-rise buildings near where we’ve been staying. Alternating images of the St. George Ribbon (more below), the Red Star, and the years 1941 and 1945 and other related iconography were projected onto the buildings. Part of the parade route included New Arbat which is the street our apartment is located on, so I headed outside about a half hour or so before the start time and braved the cold. 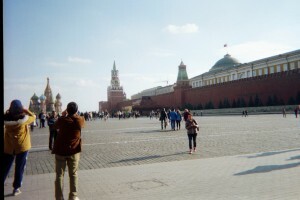 I was able to find a good vantage point to watch and take pictures, having decided that I wouldn’t walk all the way over to Red Square, reasoning that it would be too crowded and I likely wouldn’t be able to get in for a good view. 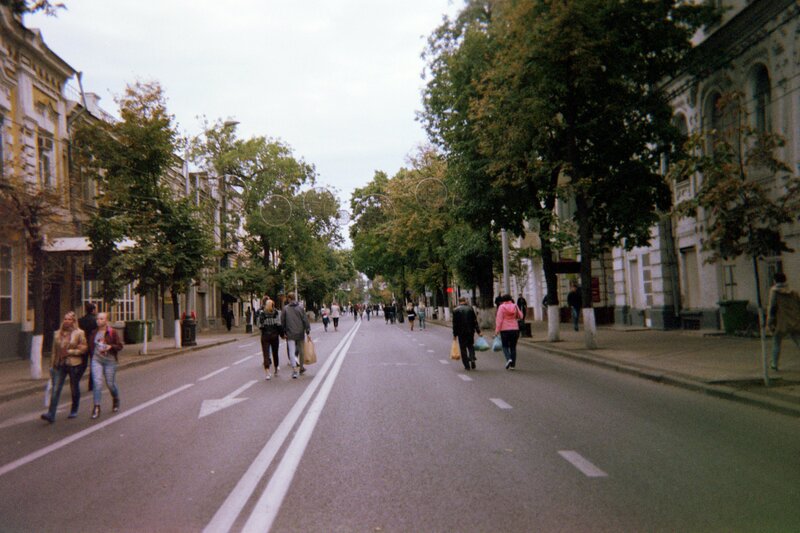 I later learned my intuition was correct and that only people who have permission can actually get into the square on Victory Day – probably officials, foreign dignitaries and special guests. 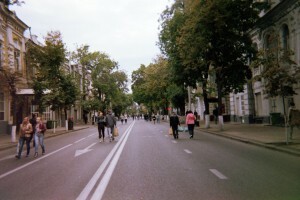 More people came out to line the streets as the time drew near. Lots of families, people with their phones out ready to snap pictures, and a smattering of individuals waving Russian flags thronged the edge of the modest barricades and tape that separated the spectators from the road. In terms of security, the atmosphere was fairly low-key. Police officers were stationed every 25-30 feet. At one point I spotted an officer on the roof of one of the buildings across the street surveying the scene. When I looked up again a while later he was gone. Many officers wore wind breakers and some had on rain coats. I did not see any guns. There was no riot gear. I saw several people sporting the St. George’s ribbon, which is common on Victory Day (image below) as it’s a symbol of patriotism and solidarity. The ribbon has its origins in the Czarist period as representing the highest military order. In recent years some nationalist groups have tried to co-opt the symbol or variations of it. The official transcript of Putin’s speech is available here. It was fairly short, acknowledging the great sacrifices that made the defeat of Nazi Germany possible, and emphasizing that Russia will never be conquered and that international cooperation is the key to preventing any future world war. According to a recent survey by the Levada Center, 76 percent of Russians planned on celebrating Victory Day this year. Interest and participation was relatively equal among Russians, regardless of age, education or income level. I thought it would be an appropriate stop given that it’s the centennial of the Russian Revolution, but it just wasn’t meant to be for me to see the inside of Lenin’s Tomb. It was not open at all on Tuesday due to the parade. Below are a couple of photos of what Lenin in repose is supposed to look like. From what I can ascertain, admission into the tomb is free but it is a very solemn and formal atmosphere. There is no talking or picture-taking allowed. 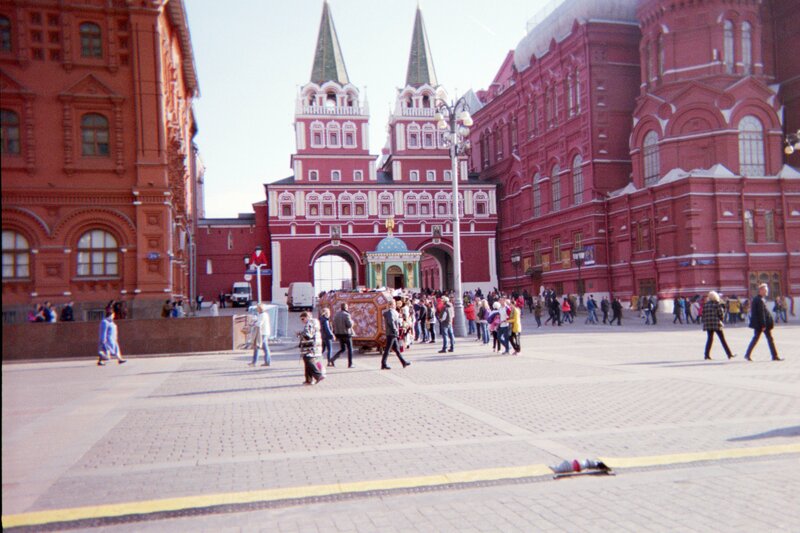 Interestingly, over half of Russians polled now think that Lenin’s body should be laid to rest and no longer displayed in public, though they want the monument itself to remain in Red Square. However, the Putin government has been hesitant to remove the body, presumably to avoid offending any of the people who grew up in the Soviet era or giving the impression that an important part of Russian history is somehow being denied. There has also been some criticism about money from the Russian budget going to maintain the preservation of Lenin’s remains. My next dispatch will cover my all-day guided tour of Moscow that will include visits to the Elbe Monument, the Gulag Museum and the Museum of Contemporary History, which has an exhibit on the Russian Revolution. And to top off the day, I’ll be taking a river boat ride. *Note: Photos I’ve taken on this trip will not be available until after I return and get them developed. Moscow River. Photo courtesy of 123RF.com. The first thing one sees to their right as they begin the descent down into Moscow’s largest airport is the sun glistening off the Moscow river surrounded by lots of greenery. It gave me the pick-up I needed after an exhausting 24 hours of minimal sleep, being crammed on several airplanes and literally running from one end of an airport to another because one flight was almost 2 hours late and nearly made me miss a connecting flight. I had to snicker in the back seat of our cab as my travel companion this time, who had never been to Russia before, freaked at the high speeds and improvised lanes that one sees on some of the major roads in Moscow. Our taxi driver, a young military veteran who works in the veterinary profession and drives for extra money on the weekends, kept getting an earful from my friend but took it in stride. I did not smell the pungent odor of gasoline in the air this time so the city not only looks clean but smells clean – at least, the section we’ve been in. Later in the evening I heard music at various times out in the distance from our apartment, alternating between classical piano and a lady’s voice singing. I couldn’t pinpoint exactly where it was emanating from, but it was pleasant nonetheless. On Sunday morning, just before 10:00 am, as I was sitting in the kitchen drinking my herbal tea, enjoying the breeze through the open window, I heard the lovely sound of church bells ringing followed by a beautiful piano sonata. About a half hour later, I ventured out to the street where many spectators were standing along the sidewalk waiting for the procession to pass by in rehearsal for Tuesday’s Victory Day Parade. Lots of families out with little ones in tow and babies being pushed in strollers. The apartment where we are staying is not as close to Red Square as we were led to believe. So I started out a little later on a long trek to the square to visit Lenin’s Tomb, which was closed the last time I was there. Walking along, this time solo, I was thinking about how I’m traipsing around in a country on the other side of the world where I don’t know much of the language, largely without an experienced guide this time. I guess I’ve gotten more adventurous as I’ve gotten older – or maybe just stupid. Sometimes it’s hard to tell. I start to smile at people around me to indicate friendliness and then I remember that Russians don’t really smile at strangers and will likely tag a smiling stranger as a foreigner or a crazy person as the old joke goes, so I keep my expressions of random good cheer to myself. 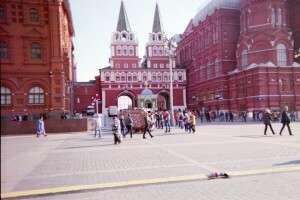 By the time I reached the front of Red Square, I realized it was barricaded off on the side I could see. It looked as though there might be some other way in but it would require me to circumambulate and risk not being able to easily find my way back to our apartment. So I decided to turn around and enjoy the walk back. I’ll have to wait until Tuesday after the parade to see Volodya in all his mummified glory. My next dispatch will be in a few days and will cover the Victory Day celebrations and my guided tour.